Old Boar took the runners on a splendid 8km run through the Botanic Gardens, thence via some tasty South Yarra real estate towards Fawkner Park. Despite attempts by our visitor from Switzerland, Sexposure, to get us all lost, we found trail which took us back around Melbourne Grammar and across to the Shrine of Remembrance. 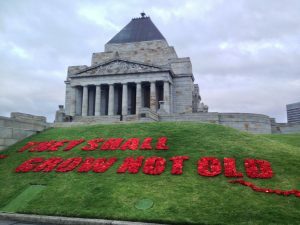 The Shrine was surrounded by a sea of bright red crocheted poppies in celebration of the 100th anniversary of the end of WW1. The poppy trail looked poignant in the evening light. Then it was back along Birdwood Avenue to home. Run was awarded 69/70 and the walk 60/69 while everyone agreed that Codpiece’s middle eastern dinner of salads and falafel in pita pockets was perfect. Astro, Cut Loose and Cheesecake recently completed the approx. 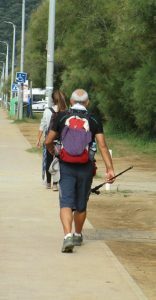 800 km Spanish Camino via the Camino del Norte along Spain’s northern coast and the Camino Primitivo through the mountains to Santiago. As Astro, told everyone last night, Cheesecake completed the entire walk with no blisters. Here’s how…. For months, Cut Loose researched the various Camino discussion groups and blogs to help us decide on the best long distance walking footwear. Should we wear high sided hiking boots suited to all terrains which would protect our ankles when the going got rocky or should we go for lightweight trail runners? Boots are protective but heavy and maybe even hot, while trail runners are riskier but easier on the feet when you’re fatigued. In the end Astro went with his hiking boots which he was happy with, while Cut Loose and Cheesecake settled for trail runners. 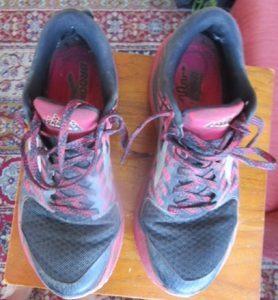 Cheesecake’s Brooks trail runners after 800km. They were bequeathed to the people of Spain. I could still smell them from Portugal. The owner of ‘Active Feet’ shoe shop in Sandringham bought his second Porsche thanks to us. Cut Loose’s dodgy feet are heaven on a stick for podiatrists. They pointed her in the direction of self adhesive fabric tape or dressing. The idea is to anticipate likely blister ‘hot’ spots on your feet and tape them before you walk. When Cheesecake’s Dad went to heaven, he left her his bunions. So bunions and big toes were taped up each morning. There’s also a product called Compeed which Cut Loose used successfully to treat blisters. The morning tapings were annoying and time consuming, but I didn’t get blisters! Next the socks. 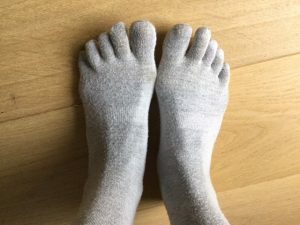 Cheesecake wore ‘injinji’ sock liners which act as gloves for the feet, keeping those pesky toes separated. Lastly it was on with the ‘Wright Socks’, the loveliest, comfiest of socks. Daily sock washing and drying was a challenge – we frequently started the day with wet socks attached to our packs.